And yes, his name was announced as Bamse, but I called him Ollie in my head, so Ollie is his name! 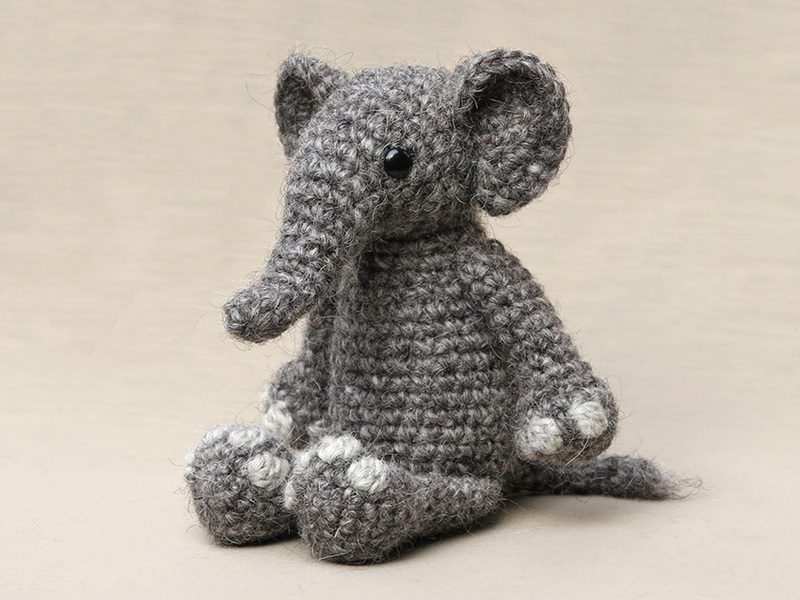 Here he is, my crochet elephant pattern. I am so delighted with Ollie his looks. Every time I design an animal, I am a bit insecure if I will manage to get it right. Usually, when the head is finished, I feel more secure because the face already is so dear to me. And Ollie his face was, but because I designed the head a bit tilted, I had no idea how it would look attached to a body. Would this face work? It might have been more easy if I had made the trunk and head separately, but I really wanted it to be one piece. When a prototype body was finished and the head was pinned to it, I could breath easily again. It looked splendid, the head worked! The arms and legs really had to have four toes I decided. But when I had them finished, they just looked huge. So, I made new ones, three toed this time, but as round as possible. Now Ollie was almost finished and needed to be sewed together. Yet a smaller body was made and everything was attached. Strangely now, I found the feet a wee bit small comparing to the rest of the elephant. But that was not such a bad thing really, now I could make the feet four toed. It is a strange thing how parts of a doll can look so much different pinned on, than sewed on. I think Ollie has turned out to be a very sweet looking elephant. When I took his pictures, I was slightly disappointed with the result. He just did not look like himself but a more serious version. By change, I played a bit with his trunk and suddenly noticed that in the pictures where it was bended more upwards, Ollie did look how I wanted him too. It was just the position of the trunk that made him look older and wiser, and I wanted him to look young and curious. Voila, problem solved! 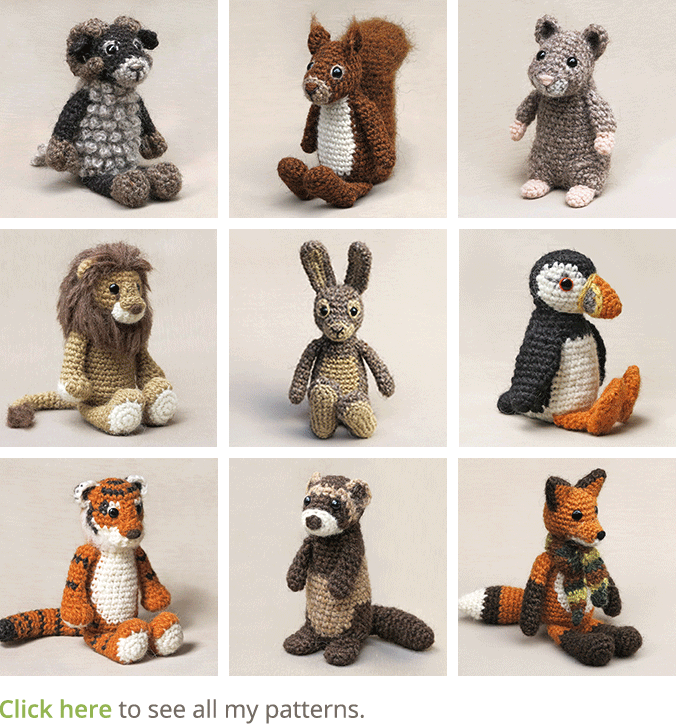 Here are some more pictures of Ollie and below them you can find info about the crochet pattern. Ollie the crochet elephant is sitting almost 5 inch /13 cm tall. He is made with my favourite Lett Lopi yarn, which makes him look very cute and cuddly. You can find the pattern to make him in my shop and in my shop at Ravelry. 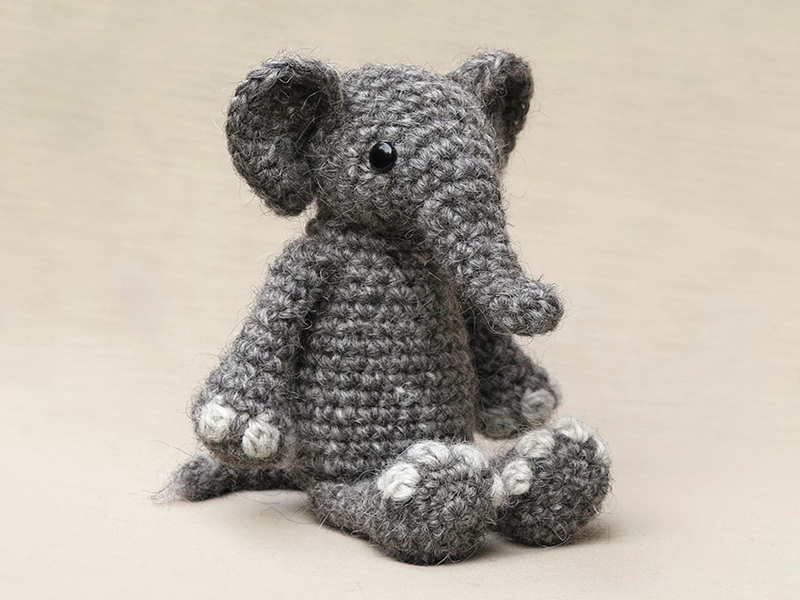 It contains a clear description of how to crochet and assemble the elephant with example pictures at the bottom to help you get everything right. 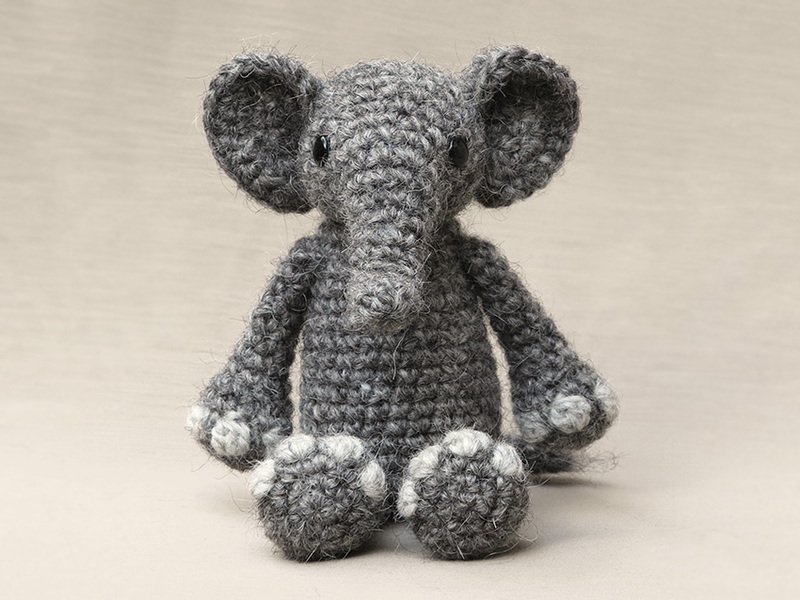 In the pattern you can also find what materials you need, the Lopi colour numbers, in short, everything you need to know to make your own magnificent little elephant. 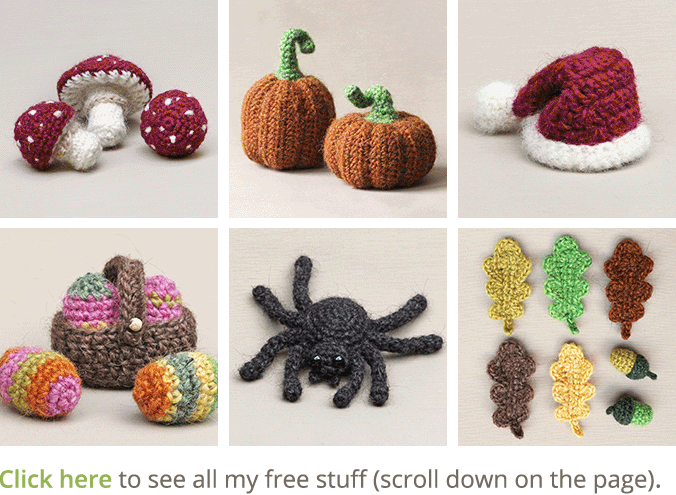 And heads up, the pattern has a one dollar release discount till the 18th of februari. Another adorable little creature to add to the collection – he’s super! Another super cutie; looking forward to Ollie! 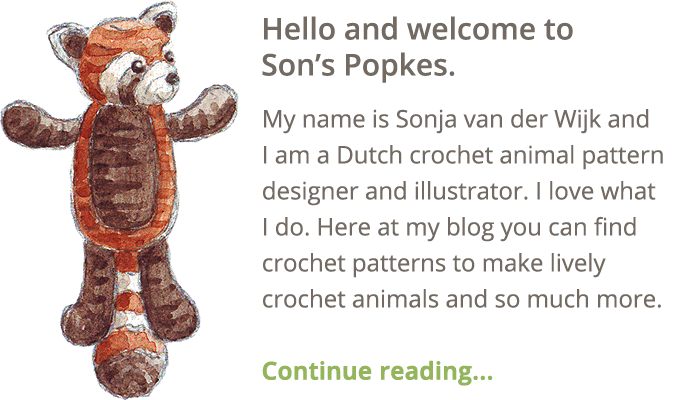 A perfect pachyderm indeed 🙂 He’s just adorable Sonja… you are so clever! So cute! You’ve done it again, as we all knew you would! Somehow I missed in your post that he was ready already. I think he’s the Elephant’s Child. Maybe a crocodile needs to come next?